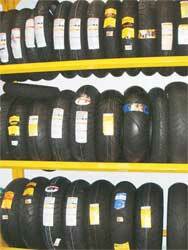 We have tyres available for most motorcycle wheels. If the tyre you require is not in stock every endeavour will be made to obtain it for you. There are usually special "deals" on and off during the year, give us a call for details. Fitting to loose wheels is free of charge. We can fit tyres on to your bike, however you will be charged for this service and you will need to call and arrange a convenient appointment. Inner tubes are carried in stock. Prices start from £7 for tubes up to 14" and from £8 for 15" upwards. We also carry certain heavy duty inner tubes.